In September of 1910 the English naturalist Richard Lydekker received word from a Piccadilly taxidermist Mr. Rowland Ward. He reported that the skin, scull and horns of an unknown kudu-like antelope had been brought into his taxidermy shop. The animal had been shot in the Abyssinian Highlands by a Mr. Ivor Buxton earlier that year. It appeared to be a cross between an nyala and a kudu and it was suggested that it be known as the spotted kudu. Lydekker received the donated specimen on behalf of the British Museum and gave it the Latin name Tragelaphus buxtoni. He thought that it looked more like an nyala than a kudu and decided on mountain nyala for it’s common name. Little did he know at the time that the link between this endemic species and safari hunting would be responsible for the preservation of Afro-montane forest in central Ethiopia in the 21st century. Ethiopia has a human population of around 95 million and apart from the 7 to 8 million who live in the capital Addis Ababa the populace is mostly pastoral. Subsistence agriculture is the dominant economic activity. As the human population continues to grow there is an ever increasing demand for agricultural land which places extreme pressure on the country’s wilderness areas. Forests in Ethiopia may have at one time covered as much as 35% of the country but this has since been reduced to around 2.3%. 58 Forest Priority Areas covering 2.3 million hectares have been designated to conserve the forests of the country. Despite this official protection a multitude of intertwining factors are contributing to deforestation of some 163,000 hectares annually. This environmental degradation has forced the forest administration to seek an alternative to a government command-controlled conservation approach. In Ethiopia all land belongs to the State but participatory forest management has been established in the Forestry Priority Areas. The objective is to achieve sustainable forest management through community empowerment. One of the income-generating options available is safari hunting and this has proved to be lucrative for these communities. The mountain nyala is the key species. Eco-tourism is also promoted but safari hunting is around 5 times more profitable. 60% of both the hunting licensing fees and the concession fees goes directly back to the villages but it is not distributed equally. Those that are seen to participate more in forest management practices receive the greater share. This weighted system of income sharing incentivizes the communities to be more conservation-minded. The forestry authorities have realized that monetary benefits alone will not work. The people must also have controlled access to forest resources. Twice a week the villagers are allowed into the forests to recover dead wood. The felling of live trees is forbidden. Honey gathered from beehives made out of dead tree trunks is also permitted. There are five hunting operators in Ethiopia that currently hunt the mountain nyala and they are responsible for protecting around 2 000 square kilometers of forest. Jason Roussos is a native 4th generation Ethiopian and co-owner of Ethiopian Rift Valley Safaris. He is a professional hunter but also has a degree in wildlife biology. His company currently operates in 5 controlled hunting areas and within each of these areas 15 to 20 people are employed on a fulltime basis as forest guards and game scouts. In 2004 a scientific paper on the status of the mountain nyala in Ethiopia was published in the African Journal of Ecology. The conclusion of this study was that the total population of mountain nyala throughout the country was estimated to be less than 1 000 and that the study area, the Bale Mountains National Park, encompassed 95% of the total mountain nyala population. This implied that there were only 50 nyala in the rest of the country. At the time there were 7 safari hunting companies operating in different areas across the country, all of which were producing top quality mountain nyala trophies. The validity of the paper had to be called into question. If the findings had been accepted by various conservation bodies such as the IUCN, CITES or the US Fish and Wildlife Service, it would have spelled the end of mountain nyala safari hunting, the mountain nyala as a species and the Afro-montane forests. 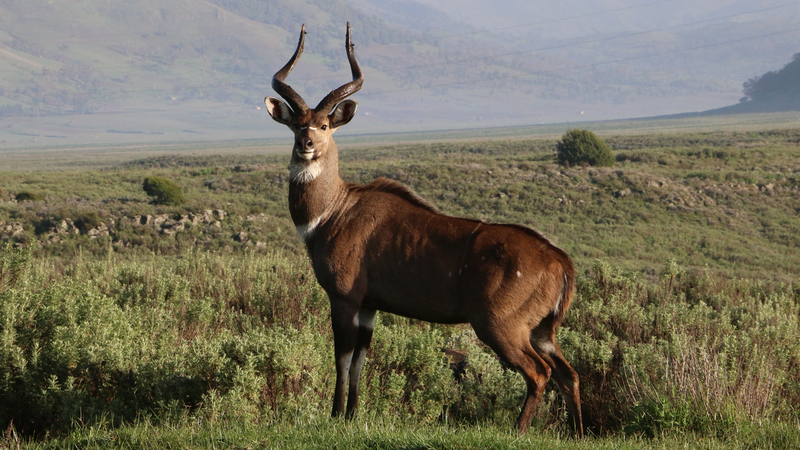 Ethiopian Rift Valley Safaris teamed up with researchers from Colorado State University, Fort Collins to undertake practical mountain nyala research in Ethiopia. Using satellite imagery, field observations and advanced statistical algorithms the researchers are able to monitor mountain nyala habitat. This invaluable work has shown that mountain nyala populations are healthy and that safari hunting actually enhances the survival prospects of the species. The future of the Afro-montane forests of Ethiopia is inextricably linked to the fate of the mountain nyala and without safari hunting that species prospects would look grim. For wildlife conservation to work in Africa a balanced approach is needed which takes into account both economic factors and the socio-cultural needs of the indigenous people. The mantra of the anti-hunting lobby is that hunters are not conservationists. Their claim is that hunters are only interested in satisfying a bloodlust and have little concern for wildlife or the environment. The truth of the matter is that those who utilize a natural resource are most likely to want to conserve it.